I met a woman, she had a mouth like yours she knew your life she knew your devils and your deeds and she said go to him, stay with him if you can but be prepared to bleed. 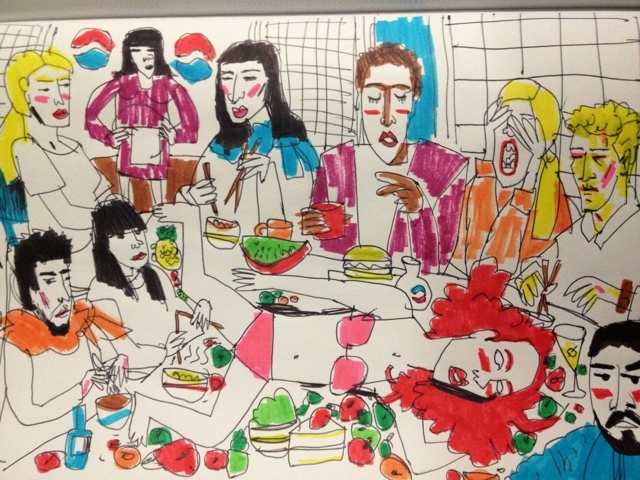 My friend Gonzalo drew the above picture, of the dinner after my opening. I absolutely LOVE IT. I am pretty sure that's me lying on the table, that wasn't exactly how it went down you know but it's pretty close! I love how it's like some super warped last supper or something and I love how I can pick out all my friends. Today I did NOTHING. Seriously like I'm actually embarrassed. Well I went to Savers in the morning, that was one thing, but then I literally got back into bed, at like 12, and lie there for the whole afternoon. I didn't really sleep or anything but I didn't do anything else either. It was weird. I guess it was me like physically coming to terms with Friday maybe? Just thinkin' about stuff. I feel really *emotional* or something, in a good way, like I feel happy but I feel like I'm feeling lots of intense things and experiencing some new feelings that I haven't felt before and just starting to accept them and feel comfortable with them. A good song for feeling is of course Fleetwood Mac's 'Landslide' that has serendipitously come into my life many times of late, and of course Joni Mitchell who is my number one gal at the moment. I'm still thinking a lot about that thing I wrote about before which was that my art doesn't make me or other people feel as intensely as music does. I want my art to be entangled in people's lives, to momentarily emotionally paralyze them or something (...in the most non-violent way possible, of course). I was thinking about visual artists who I think have achieved this, you can probably guess but first I went to Rothko - I mean he has been a major inspiration for me and over time I've seen a few of his works in real life, and I do honestly get that kind of hugeness of sort of existence or something, there's a real humanity about his work and a sorrow that I find so moving. Matisse moves me. I want to see monumentality in art, and sentimentality. I want to be obsessed with it, in rapture in front of it. I want a grand emotional flooring. I want to intensely feel. I don't want to be all like "Art these days..." but I wish there was more art that I saw in real life, that made me feel like people feel when they see the Sistine Chapel or something. Have I mentioned 'Florence Syndrome' before? Click the link. I find this reassuring that my grand desire in art can possibly come true. I really am going to try and make this happen in my work. In the meantime all I need are a few vague reassurances of summer, that transcendent beginning of The Rolling Stones' 'You Can't Always Get What You Want', and some time with people who feel more like home than ever. I like how you write about sentimentality and i like how you aren't afraid of admitting that you like it. It's so hard to admit that these days because everybody just thinks your all into soft toys and rom coms and being insistently cloy.